May the 4th gives Bundesliga.com a chance to a look at the teams who need the Force on Matchday 32 and those who are in danger of turning to the Dark Side. "Julian, I am not your father"
Two of the most devoted disciples of the Force of attacking, entertaining football meet on Saturday. Whichever side feels it flowing through them strongest, they will be in pole position for a place in in next season's Champions League group stage. Normally, opposition coaches could tell Thomas Tuchel, "I could be your father," but it is the Dortmund boss who is the doyen of the duo with Julian Nagelsmann, 29, the young pretender. Their lightsaber duel across the dug-outs will be played out on the pitch by their teams, though perhaps the winner of the battle between their two henchmen, Hans Süle and Aubameyang Kenobi, will decide it. Whoever does win will be on Cloud (Nine) City! 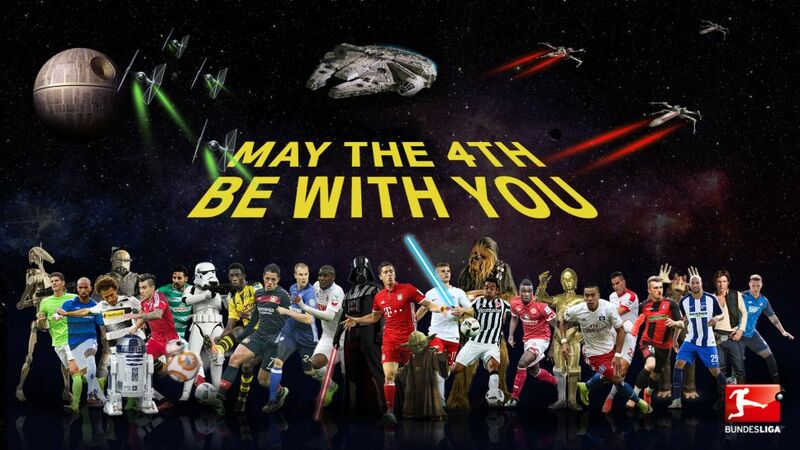 For Darmstadt fans, Bayern live in a galaxy far, far away with the gulf of the whole table between them. Bayern possess the firepower and speed of the Millennium Falcon; Darmstadt are the Bundesliga's Ewoks: brave, but armed with catapults. Bayern have followed their destiny in claiming a 26th Bundesliga title, Darmstadt have yet to let go of their hate of relegation, and have been AT-AT it in recent weeks, winning three in a row. But they may have no choice other than to let the Dark Side of the Drop overwhelm them if they fail to win in the Allianz Arena. There is little doubt RB Leipzig have been the Anakin Skywalkers of the 2016/17 season. Young, daring, highly gifted and dangerous, Ralph Hasenhüttl's men are hurtling towards a shock Champions League campaign next season after making the jump to the top flight at light speed – and victory in the capital would finally clinch it. There have been a number of standout performers, but none more so than Timo Werner, surely a contender for Wookiee of the Year. The pod race for a Europa League place is hotting up faster than a womp rat in Luke Skywalker's line of fire. No fewer than seven teams, from fifth-placed Hertha to Frankfurt in 11th and divided by just five points, are in the hunt, engaged in an X-Wing vs. Tie Fighter battle royale. Matchday 32 victors will live to fight another day. The vanquished will be frozen out. Most likely in carbonite. "I have you now" the black-robed Dark Side of relegation said as it breathed heavily and ominously in the general direction of Werder Bremen. They were directly in the line of fire, but unlike Alderaan, Bremen have somehow escaped what had seemed to be their destiny. Win at Cologne on Friday, and the Green-Whites' will take a major step towards a European place and completing a Return from the Dead(i). Check out the tactical breakdown as Borussia Dortmund and Hoffenheim do battle for third.